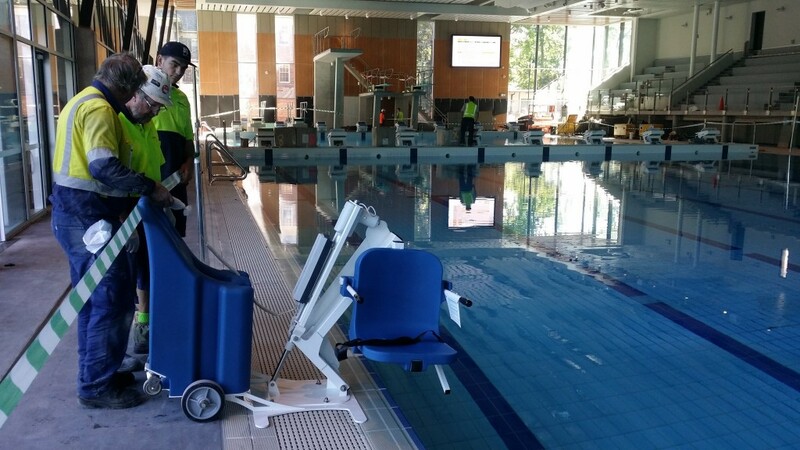 One of our distributors “Shane of Push Mobility” showed the features and benefits of the portable pro pool lift to Pymble ladies college in Sydney and they decided this was the best option for their brand new olympic aquatic centre. 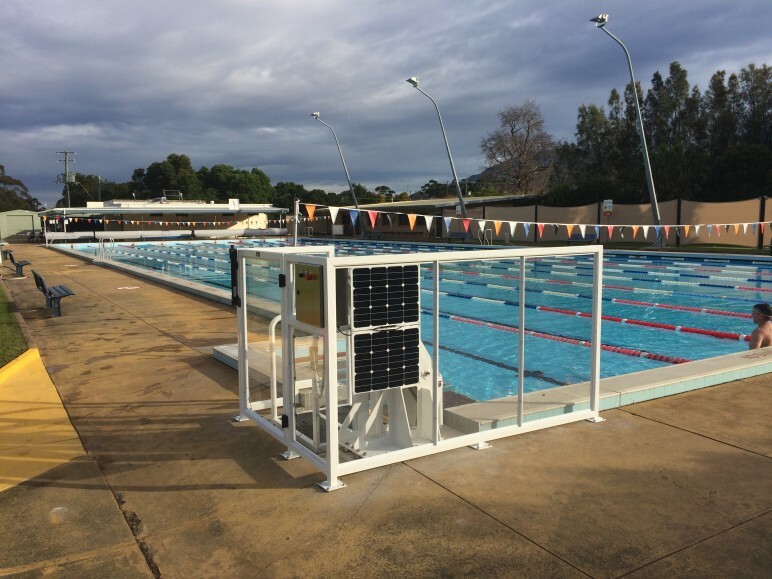 Jacinta and Bruce delivered and installed the portable lift at the end of the construction phase just prior to the hand over of the pool to the college. 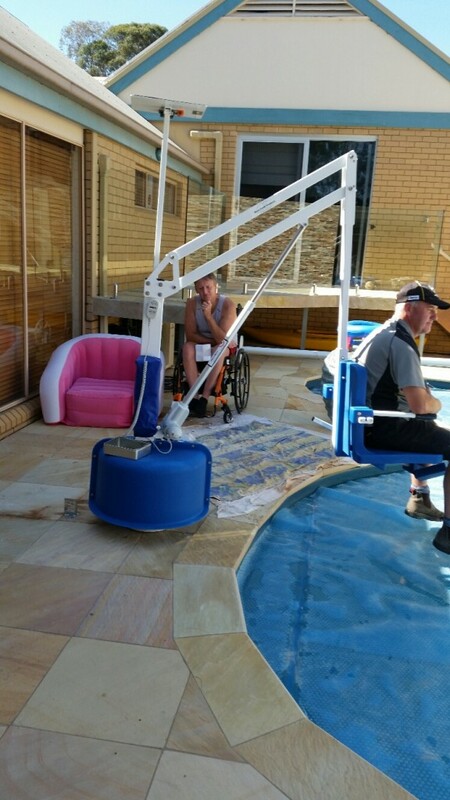 Glen ( our Melbourne installer ) and his assistant doing a final test on a new Revolution lift installed in Bendigo. This lift has a solar panel to keep the battery topped up. The existing concrete around the pool was not thick enough for the lift and so Glen installed a new slab in the lift area and re installed the tile. 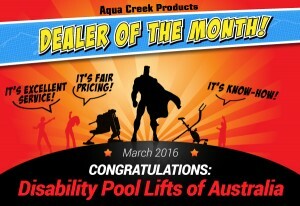 Jacinta is so pleased that Aqua Creek appreciate the work she is doing in Australia matching up people with needs to the Aqua Creek Product. 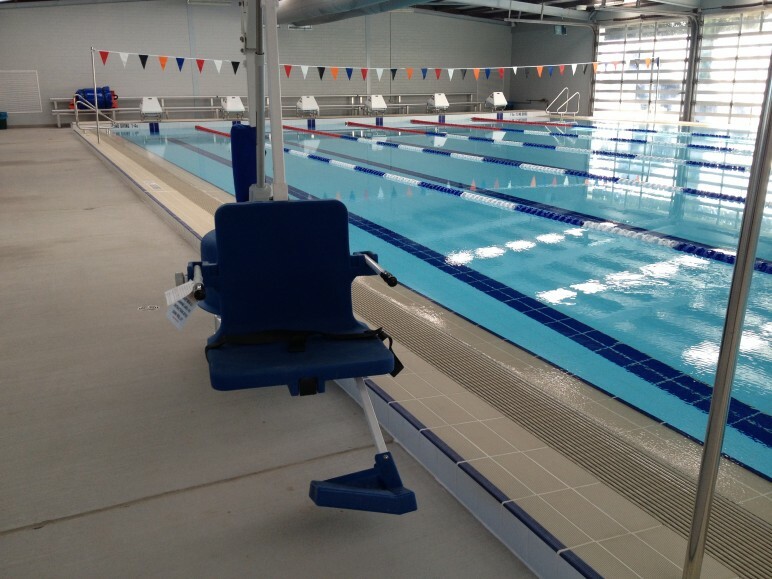 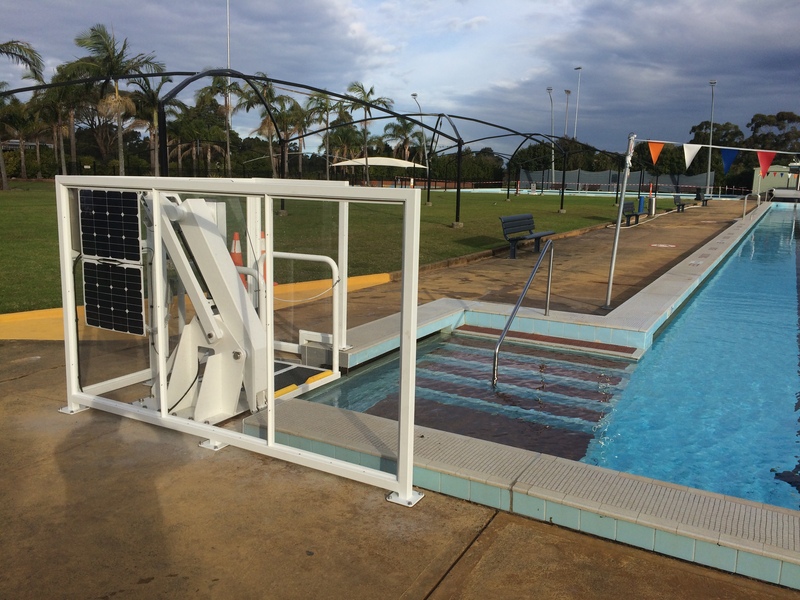 Wollongong council installed a CMA Heavy Duty Pool lift at their corrimal pool. 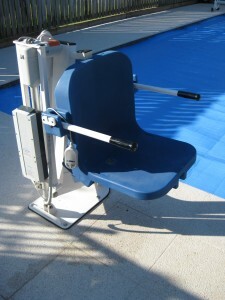 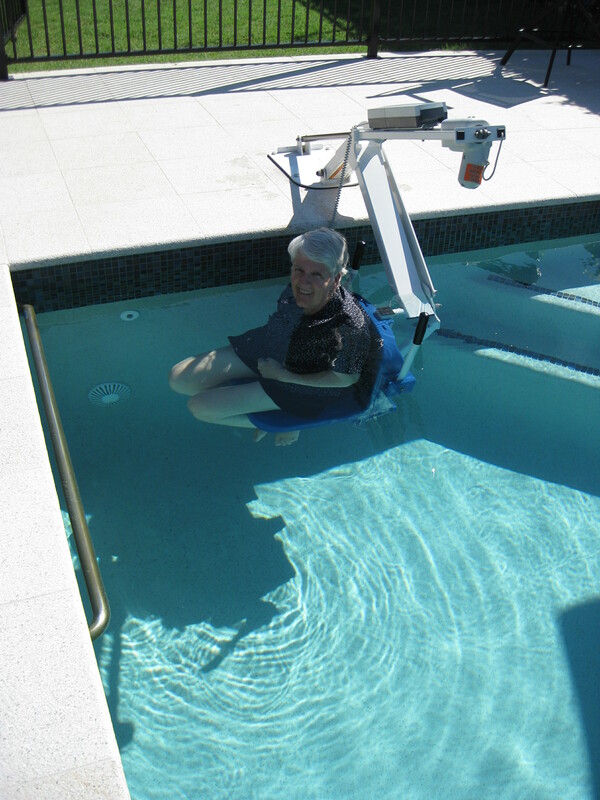 This allows a person in a wet chair to lower themselves into the pool or for a person with hip or knee problems to stand on the platform and lower themselves into the pool. 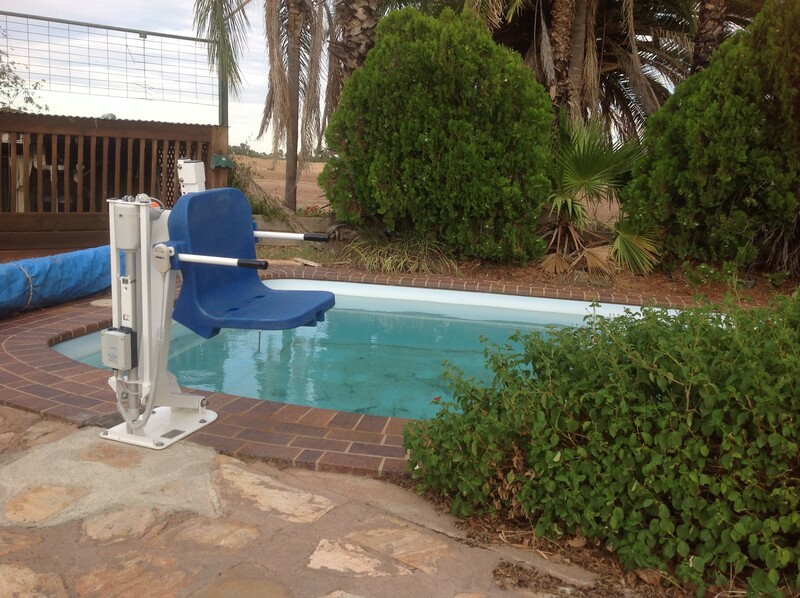 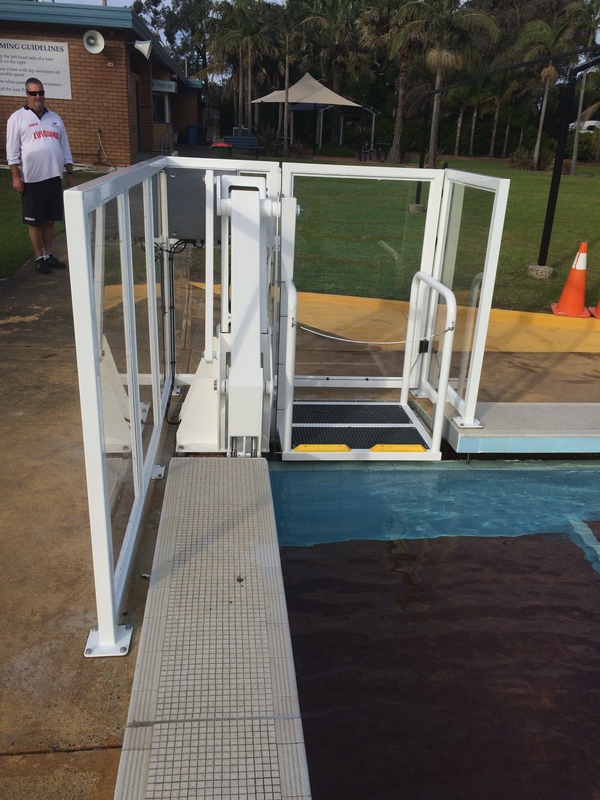 The lift has the capacity for a helper to also be lowered into the pool. 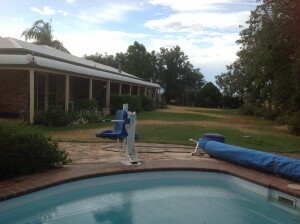 The solar panels keep the batteries charged. 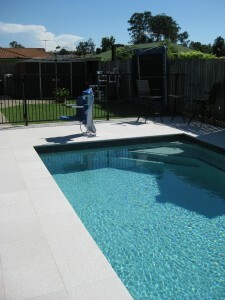 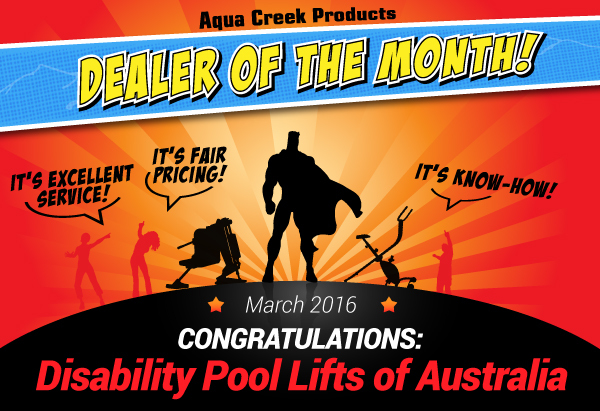 Anita installed a pro pool lift in her beautiful home pool in Brisbane. 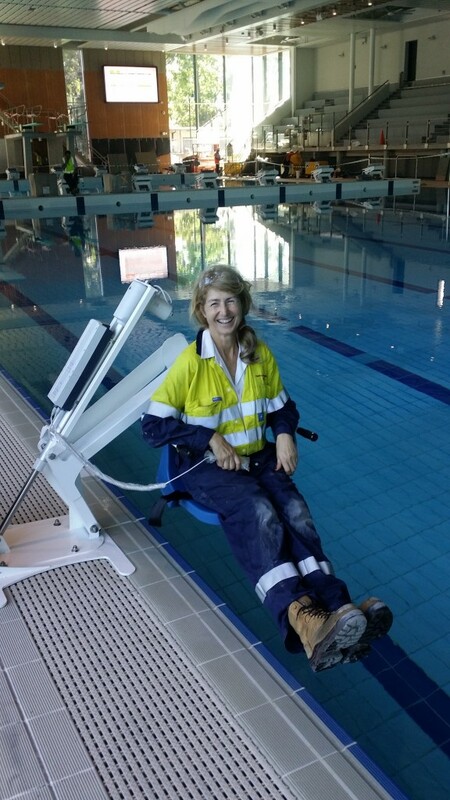 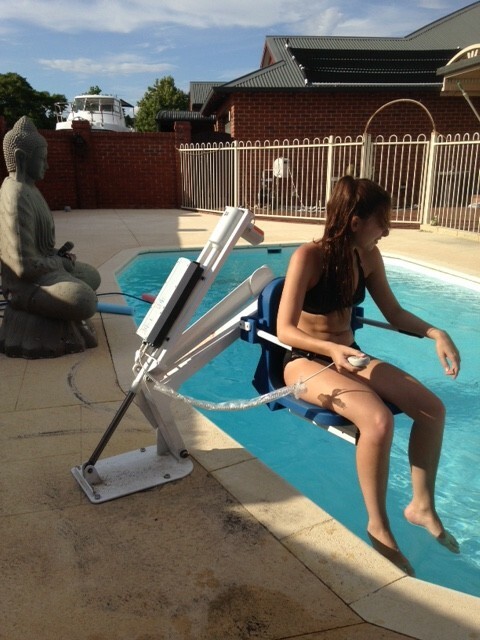 Anita said “the pool chair is amazing and enables me to stand/walk and exercise in the water” Jacinta from DPLA is so pleased that she can help make a difference to peoples lives. 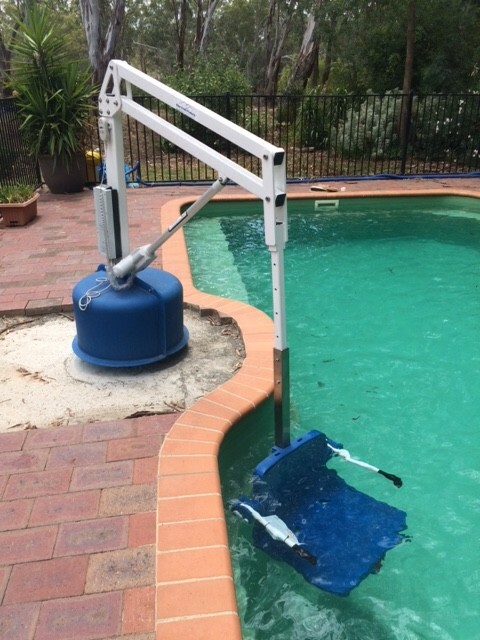 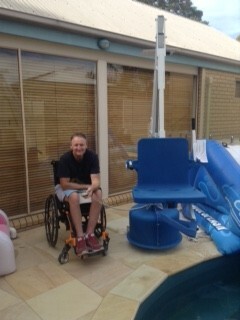 Scotty has a revolution lift with an extended arm installed in his home pool. 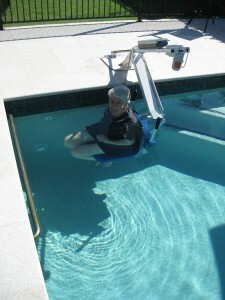 This photo is during installation before the tiling was finished. Completed photo coming soon. Sutherland Council Swimming Pool installed a deep draft version of the Pro Pool Portable Lift at the Sutherland Leisure Center. 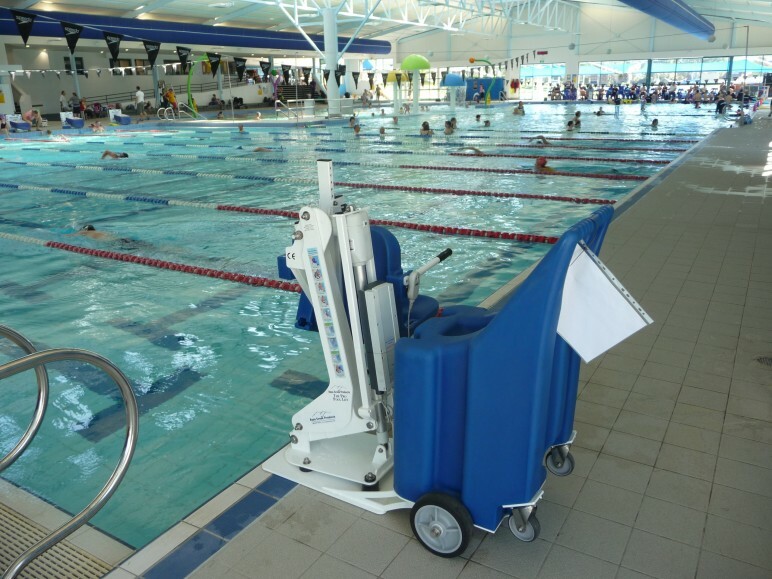 Lake Maquarie Council exhaustively researched the best disabled access lift option for their pool redevelopment and settled on the Aqua Creek Revolution lift and installed them at Torronto, West End and Speers point pools.